Elegant and simple to prepare, hams are the ultimate special-occasion fare. Although they're most often baked, your Crock-Pot can easily tackle the job, leaving your oven free for other dishes such as roasted vegetables or baked potatoes. You don't need much more than a ham and Crock-Pot for this dish, but you can add a burst of flavor by whipping up a simple glaze for the ham. The ham will take several hours to fully cook, so set in the Crock-Pot in the morning for a dinnertime feast. Lightly grease the slow cooker with non-stick cooking spray or oil. Remove the ham from its packaging and place it in the slow cooker. Brush the ham with a glaze, if you wish. Honey, brown sugar, maple syrup, Dijon mustard, fruit juice or jam all work wonderfully. Canned cherries or pineapples also make excellent additions. Cover the Crock-Pot and cook on low until heated through, about 5 to 6 hours for a 5-to-7 pound boneless ham. 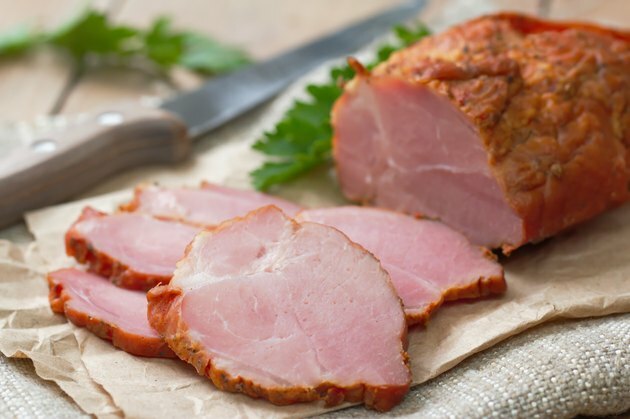 Always heat cook-before-eating hams to a minimum internal temperature of 145 degrees Fahrenheit to guarantee safety. Cooked hams should be heated to 140 F before eating.